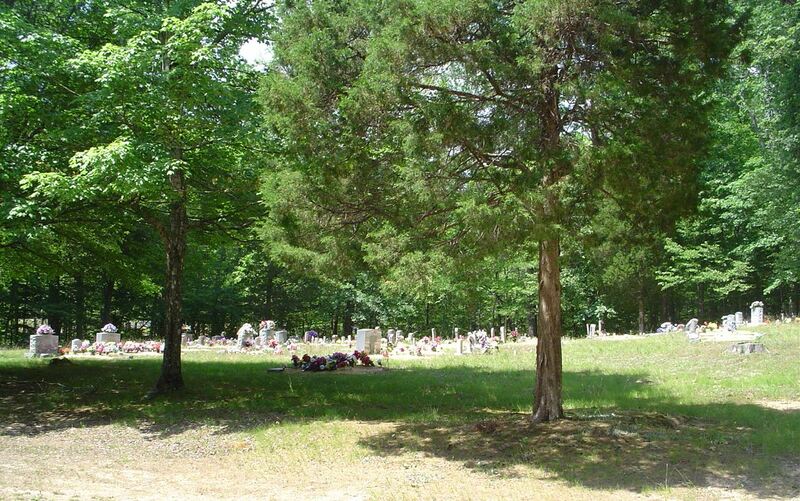 The Cole Cemetery is located on the hill across from the Lower Glenrock rest area on the Natchez Trace Parkway. To reach the cemetery, at the crossroads just south of the rest area, travel east for .01 mile. Turn left and go about .15 miles to the cemetery. There is one grave with no marker but it is situated among the Creecy graves and is most likely a Creecy child. Cole, “Lizzie” Evans (Lineberry); b. 14 Jul 1846, d. 18 Jan 1935, wife of J.W. Cole, Myrtle; b. 02 Aug 1899, d. 17 Nov 1900, daughter of J.G. & R.A.
Creecy, Lonney N.; b. 08 Dec 1899, d. 11 Nov 1900, son of J.C. & H.N. Creecy, Noah I.A. ; b. 22 Sep 1891, d. 20 Apr 1916, son of J.C. & H.N. Matney, Sarah E.; b. 01 Aug 1916, d. 10 May 1918, daughter of J.M. & E.B. Matney, Sophy; b. 13 Apr 1846, d. 09 Jan 1908, wife of J.W.